DiamondAura® delivers the transparent clarity and dazzling brilliance of luxurious, large carat weight diamonds without the outrageous cost of mined diamonds. 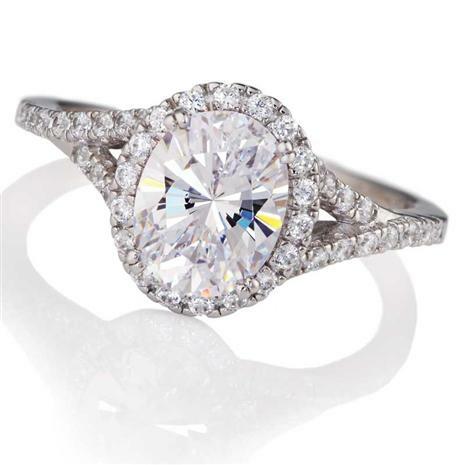 The only thing rarer and more costly than a perfectly colored diamond is a perfectly colorless diamond. Take for example, the Moussaieff Red Diamond, discovered in the 1990s in Brazil, and sold for an estimated $8 million in 2002. Little more than 10 years later, the Pink Star, a magnificent pink diamond, fetched 10 times that much when it sold at auction for $83.2 million in 2013. But both pale next to a truly colorless and near flawless stone like the Koh-i-Noor diamond, which is part of the British Royal Crown Jewels and has been deemed literally priceless, meaning no amount of money could possibly purchase it. We can't offer you any of those stones today, especially not the Koh-i-Noor. But what if we told you we could offer stones that actually surpass those astronomically priced diamonds for color and clarity, and could do so for a fraction of the cost? Thanks to the precision of technology, our Stauer Priceless Ring of lab-created DiamondAura® stones can be colored perfectly with a clarity that even those famous stones would envy. Each gorgeous ring features a 2 carat oval beauty with an additional ¼ carats of sparkle accenting the center stone and shoulders of the gleaming sterling silver setting. The 4 C's. DiamondAura retains every jeweler's specification: color, clarity, cut, and carat weight. The transparent color and clarity of DiamondAura emulate the most perfect diamonds — D Flawless, and both are so hard they will cut glass. While the British Royal Family will refuse all offers for their beloved stone, we're offering the Priceless Rings for this exclusive Stauer price.